Find out what you need to do to add your environment to Davis Assistant. 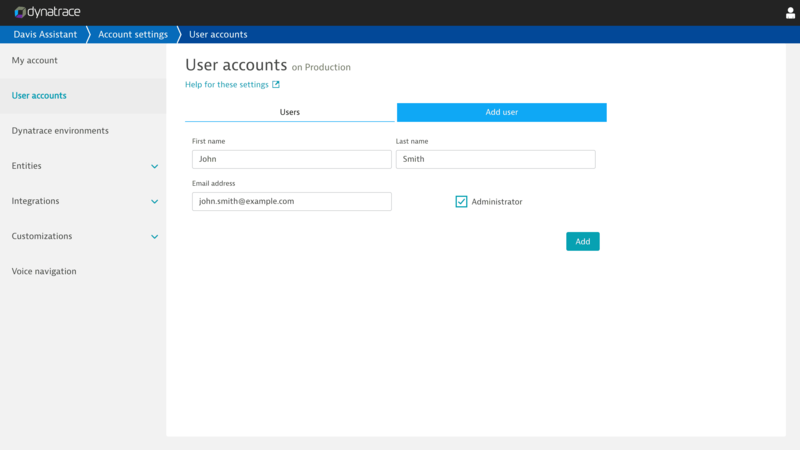 Dynatrace SaaS environments associated with your Dynatrace account are automatically added to Davis Assistant. Managed environments must be manually added. Note that only Dynatrace users with administrative privileges can add API tokens. Managed environments require that all additional users be added based on their email address&apos; domain name or via manual entry. Depending on the version of Dynatrace Managed, the Davis Assistant token generation button may not exist in Dynatrace modules. In this case, the administrator should generate a Dynatrace API token instead of a Dynatrace module token. An API token is required for each Dynatrace environment you plan to add. The environment wizard appears if a selected Managed environment has an invalid or missing API token (in which case, you can skip to step 2). If there are no SaaS environments associated with the user account, a form for adding a Managed environment is displayed. Users with at least one associated SaaS environment with a valid API token added to Davis Assistant can add Managed environments under the Add Managed environment tab in Account settings > Dynatrace environments. 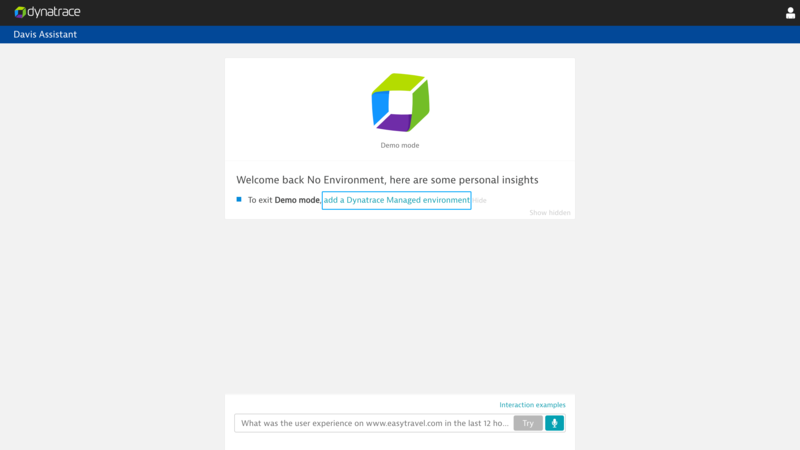 Click the add a Dynatrace Managed environment link. 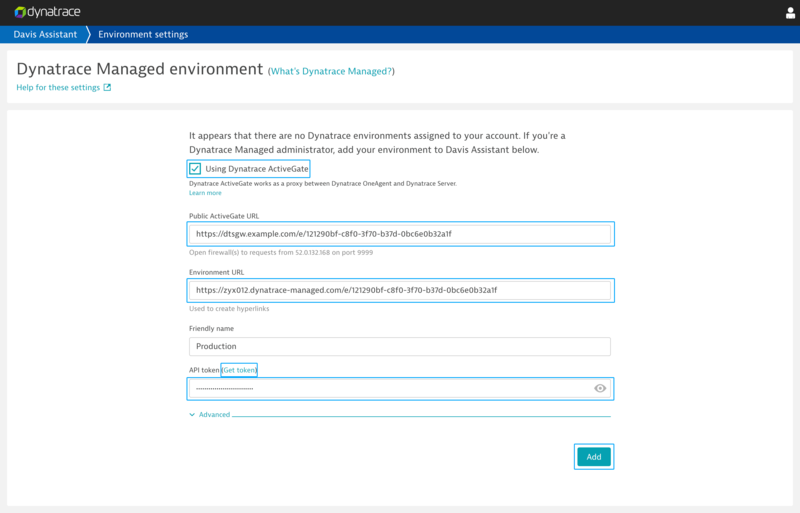 If the add a Dynatrace Managed environment link isn&apos;t visible in the card, you can still add a Managed environment by navigating to Account settings > Dynatrace environments > Add Managed environment. If you&apos;re using a Dynatrace ActiveGate, enter the Gateway URL into the Cluster ActiveGate field. Otherwise, uncheck the Using Dynatrace ActiveGate box. Enter the URL of your Managed environment. Follow the Get token link provided in the API token label. Type a name for the token and click the Generate token for Davis button. Click the arrow button of the newly created token to reveal token settings. Click the Copy button to copy the token to your clipboard. Return to the Davis Assistant setup page. Paste the copied API token into the API token field. Each environment&apos;s API token can also be set in Account settings > Dynatrace environments. Dynatrace Managed users must first enter a valid environment URL before they can type in an API token. If you&apos;re using a Dynatrace ActiveGate, ensure that any firewalls are open to requests from 52.0.97.215 on port 9999. If you&apos;re not using a Dynatrace ActiveGate, ensure that any firewalls are open to requests from 52.0.97.215 on port 443. Due to differences in the information available to Davis Assistant for Managed and SaaS environments, Managed environment administrators must add other users manually. Note that the User accounts section within Account settings only appears if the active environment is a Managed environment and you&apos;re a Davis Assistant administrator. The active environment can be changed in the User profile menu in the top-right corner of the Davis Assistant UI. Click on the User profile button (icon) in the top-right corner. Ensure that a Dynatrace Managed environment is selected in the User menu, go to the User accounts section within Account settings. Optionally, administrators can enable domain name-based user addition. This option allows all users with a domain name in their email address that matches an administrator&apos;s email address domain name to automatically add an associated Managed environment. Enable this option by clicking on the switch input above the Users tab. Click the Add user tab, then enter the user&apos;s name and their Dynatrace associated email address. Check the Administrator box if the user should have administrative privileges. Server-side caching is used in Davis Assistant to improve response times and reduce Dynatrace API calls. Closed problems are cached for 30 days. Open problems aren&apos;t cached. Application, service, host, and process-group data is cached for 10 minutes. Other data accessed through the Dynatrace API is cached for less than a minute. Interaction history is stored in local storage in the Davis Assistant web application. This data can be cleared by clicking Clear interaction history within the User menu in the top-right corner of the Davis Assistant web UI. Interaction history is cleared from local storage after you sign out of Davis Assistant. Davis Assistant administrators can determine which IP addresses and port numbers are required to be accessible to Davis Assistant using the settings at Account settings > Dynatrace environments > Add managed environment. 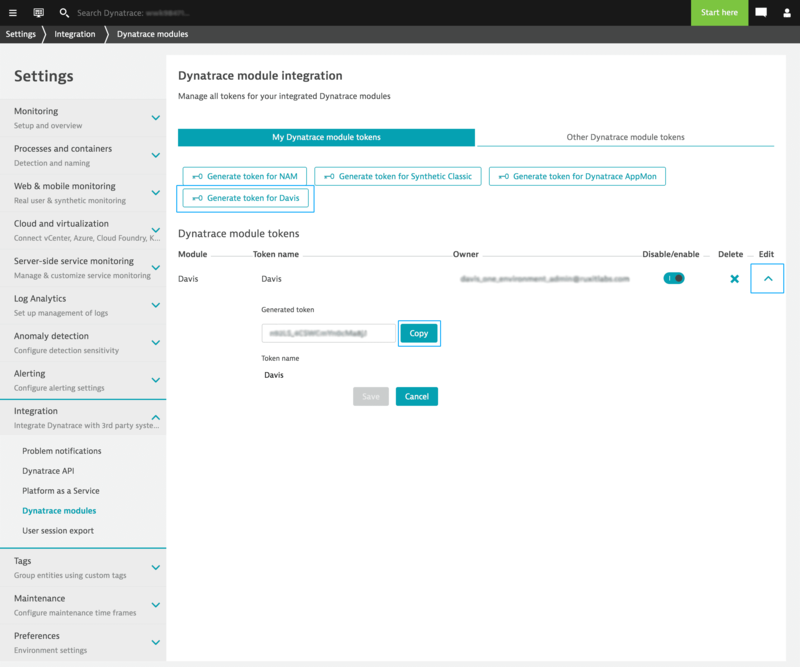 ActiveGate works as a proxy between Dynatrace OneAgent and Dynatrace Server. ActiveGate collects monitoring data, aggregates the data, and sends the data to Dynatrace Server using an encrypted HTTPS connection. ActiveGate is the only Dynatrace software component in your data center that requires full Internet access. When configuring a Managed environment, be sure to check the Using Dynatrace ActiveGate box within the Add Managed environment form and type the publically available ActiveGate URL into the associated input.